We’d love your help. Let us know what’s wrong with this preview of On Bullfighting by A.L. Kennedy. One day, on the brink of despair and contemplating her own mortality, novelist A. L. Kennedy is offered an assignment she can’t refuse–an opportunity to travel to Spain and cover a sport that represents the ultimate confrontation with death: bullfighting. To ask other readers questions about On Bullfighting, please sign up. A.L. (Alison Louise) Kennedy is a big writer in Scotland, known for her serious-minded novels, her frequent hints at suicide, and her second career in stand-up comedy. I find her a fascinating figure, and a hilarious stand-up, but haven’t been able to connect with her prose. There is something oblique and defensive about her books that makes them impossible to penetrate, although they're clearly soul-bearing and honest works. This book is an awkward mash-up of confession and non-fiction. What the A.L. (Alison Louise) Kennedy is a big writer in Scotland, known for her serious-minded novels, her frequent hints at suicide, and her second career in stand-up comedy. This book is an awkward mash-up of confession and non-fiction. What the cool kids call creative non-fiction. Get hip, daddio. The story begins with an aborted suicide attempt. Kennedy’s reluctance to die to the strains of the dire Scottish folk song ‘Mhairi’s Wedding’ tells us she is too in love with the grotesque ironies of the world to end things. As an attempt to get writing again she accepts a commission to write a book on bullfighting. Hence this book, On Bullfighting. So the work is as odd as this sounds. The focus is on toreros and bulls and the lusty carnage of the sport, stuffed with too much technical terminology and awkward reportage, interspersed with reports on Kennedy’s own state of mind. This is limited mainly to her banal discomforts and travelogue shtick, with the occasional personal memory. (One random scene shows her discussing her grandfather’s passing which proves oddly moving). The tension lies in the title. A.L. Kennedy On Bullfighting. You get A.L. Kennedy, but not enough. You don’t get enough personal insight that makes us care about this trip. We don’t get enough explanation as to her motives for making the trek to Spain. She seems to write the book in a form of post-traumatic stress disorder. You get Bullfighting. But not enough. The information is accurate and written with flair. The bullfights are shown in their goring horror and attempts are made to explain the lust for death and suffering. But opinions aren’t formed. Stances aren’t taken. You could look this stuff up online. The connections between Kennedy, the suffering author obsessed with pain and misery, and the toreros, those brave idiots dancing with death, are tenuous and the result is an uneven and frustrating work. 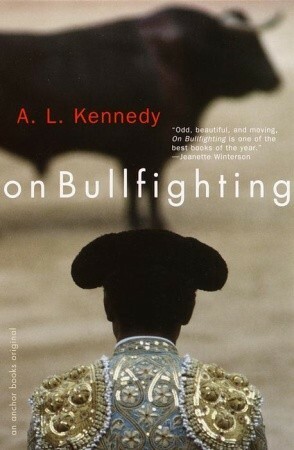 I get why people don't like this book--you either expect a straightforward book about bullfighting thanks to the title and suddenly you're facing the author's depression OR you're scouring the book for clues to Kennedy's illness but have to wade through page after page of bullfighting history. Neither seems good, right? A little too balanced, leading to a noncommittal to either narrative. And yet the book works for me. Kennedy's death-obsession finds form and, oddly, life in the hazards of the co I get why people don't like this book--you either expect a straightforward book about bullfighting thanks to the title and suddenly you're facing the author's depression OR you're scouring the book for clues to Kennedy's illness but have to wade through page after page of bullfighting history. Neither seems good, right? A little too balanced, leading to a noncommittal to either narrative. This book has saved me several times, in so many different ways. Great opening and ending. Struggle with my lack of interest in bullfighting. Pulled this from my library to read as research for a new assignment I'm working on for the League Against Cruel Sports. Can't say I'm looking forward to it. Thumbed it so far. Useful glossary in the back. Going to be somewhat interesting to read if not enjoyable. Anyway, what's a respected author like A L Kennedy (who I've not read before) writing about bullfighting? Moreover, why is Jeanette Winterson blurbing that it's 'One of the best books of the year'? Having now finished this book I can sa Pulled this from my library to read as research for a new assignment I'm working on for the League Against Cruel Sports. Can't say I'm looking forward to it. Thumbed it so far. Useful glossary in the back. Going to be somewhat interesting to read if not enjoyable. Anyway, what's a respected author like A L Kennedy (who I've not read before) writing about bullfighting? Moreover, why is Jeanette Winterson blurbing that it's 'One of the best books of the year'? Not quite the tour de force of Hemingway's 'Death in the Afternoon' but it is an update and does give an alternative glance at the subject. The concluding pages may not be to everyone's satisfaction but this work was in fact the work that brought the writer back from the brink of suicide and for that it is a unique reading experience which is woven into the text. If you are daunted by reading Ernest's tome on the subject, which may go into excessive detail and often reads like a history of the sub Not quite the tour de force of Hemingway's 'Death in the Afternoon' but it is an update and does give an alternative glance at the subject. Recommends it for: the literate. More of a self examination than an exploration of bullfighting, it gives enough about bullfighting to keep it interesting and limits the self examination enough to keep it from getting too dull. Some humor, dark humor, but funny—and some pathos. Short enough, too. Much longer and I'd never have picked it up. It is sympathetic enough to bullfighting that I might grudgingly give the activity some respect, but still think it idiocy. The writing is a little uneven. A bit of an unnecessary depression drama from the author's personal life, but luckily ends up bringing the passion from Las Ventas and gives a lot of historical facts about bullfighting I didn't know about. As a truly fan of corridas I recommend it to those who want to know what corridas are all about. Well, it was interesting at times, and slightly boring at times. I read it in bits and pieces, a chapter or two at a time. I realize now I knew nothing about bullfighting. I thought it was just a matador waving a cape at a bull and then sticking it with a sword. It's much much more than that, and I am now even more abhorrent of the whole "sport" than I was before. I never thought anyone could write a boring book about the exciting art of bullfighting but A.L. Kennedy managed it what with her constant talk about her depressions and ailments. She only seemed to remember that this was a book about bullfighting towards the last few chapters. She also got the names of some bullfighters wrong. I chose this from a list of books I could read for a Spanish class (oddly, it's in English). At the start, I was somewhat disinterested--it was just another book I had to read. But when I started reading it, it really drew me in. The bullfighting world is fascinating. Violent, yes. But fascinating. It's got so many rituals. This is a very interesting book. This book is as much about bullfighting as it is about the author. She faces the good, the bad, and the ugly in bullfighting while struggling with illness, failed relationships, and writer's block. While not a handbook on bullfighting, Kennedy weaves the history of bullfighting and its arcane rituals throughout the book. A factual and personal account of bullfighting, writers block, and glancing reference to emotional trauma. Not what I expected, but this is the first non fiction book I have read by A L Kennedy. Powerful writing as always. I'm only reviewing this pile of old tosh because I don't want other readers to believe it's actually 'on bullfighting'. It's not, and is woefully inconclusive on the subject as well as ill-informed. It's basically a long unfulfilled suicide note from a sad lady. Essays on the spanish bullfight intermingle with physical and emotional turmoil. By the end, one is given a special visitor's pass to the deeper meaning and drama of this very controversial state treasure. About living, writing, traveling, and bullfighting. Articulate and interesting. Enjoying the low-down on bullfighting, though I'm not digging the author's heavy presence so far. A well written book that was a quick read. I enjoyed it, but it was hard to get real interested in the bullfighting details. Wish the writing aspects of the book had been explored more. The title alone should compel you to pick up this book. Excellent. If you ever wanted to know more about Bullfighting you need to read this book. Very exacting and the author weaves her own life in between helping us understand the sport.